This adventure into saltwater taffy and making candy in general came as a what I found to be a challenge! As you know, I run a weekly Test Kitchen category where I work with an ingredient I haven't used before, based on your suggestions through Facebook. 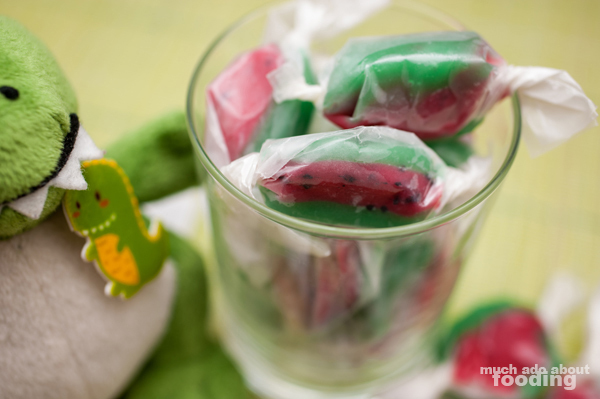 Well, when black lava sea salt was featured as one of the series' ingredients, my friend Austin put out the creative idea of using the salt crystals as the "seeds" in watermelon-looking saltwater taffy. My immediate response was, "What am I? A magician?" to which he responded, "Maybe you are and you don't know it yet." Keen observation there Austin because I did give it a try. Once you planted the thought in my mind, I couldn't resist. The first batch was ultimately a success, according to all the guinea pigs I dumped candy on in the following days. 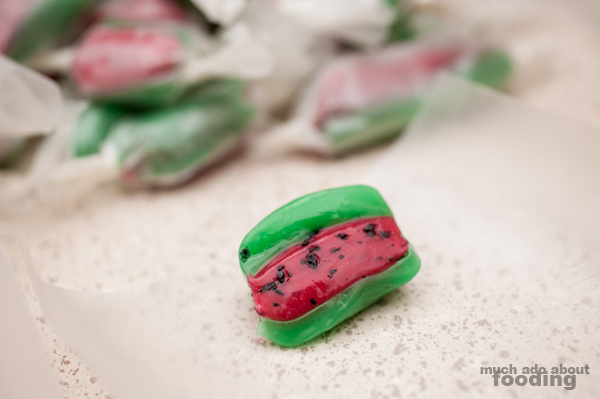 These were made to look like watermelons with the crunchy salt as the seeds but I flavored them vanilla since I dislike artificial watermelon-flavored things. I did a lot of internet sleuthing about to figure out how to even tackle this feat. I mean, I don't even make candy but reading a lot helps I guess. I was very anxious to say the least because there were so many things that could go wrong. Because taffy is created using both glucose and fructose, which have different chemical structures, one tiny crystal of sugar that isn't mixed properly and falls back into a dissolved mixture could turn the taffy into granules (sucrose). Yikes! So scary really. In the end, I used the recipe and notes mainly from this link because it was the most informative. Maybe you want to give it a try yourself now after seeing that this newbie here could do it? Mix together sugar, cornstarch, and salt. In a stainless steel saucepan of about 3-4 quarts' volume (I made the mistake of using too small a saucepan so my candy overflowed the first time and made a huge mess), add water, corn syrup, butter, and vinegar. Next, add in your sugar; the recipe poster had said that this makes it easier for you not to stir as much later by adding dry on top of wet. 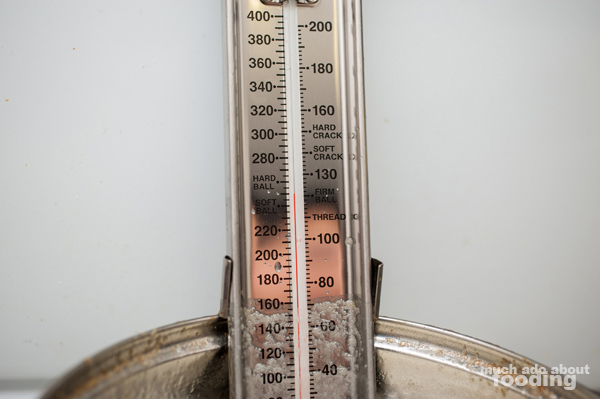 You can attach your candy thermometer now and turn the heat to medium. The temperature you are looking for is 255°F. Be careful when you stir because of the possibility of the sugars recrystalizing. 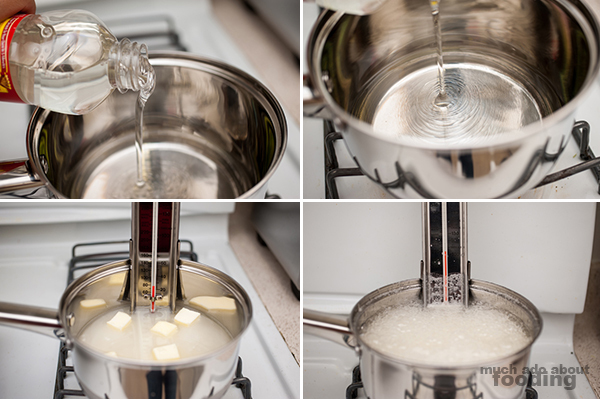 Stir the sugar mixture into the wet gently until it is all dissolved. Then you won't have to stir anymore - the heat will do the rest! Though you're looking for 255°F, you can take the saucepan off the heat a little before then as the temperature will continue to rise in the candy. Pour into a buttered large baking sheet and let cool (15-20 minutes). I sliced one-third of the whole thing once it had cooled to use for the red part of the watermelon. By making wells with my thumb into the taffy sections, I was able to add flavor and coloring (about 3 drops of red, 6 drops of green, and 8 drops of vanilla extract). Before handling, butter your hands well. 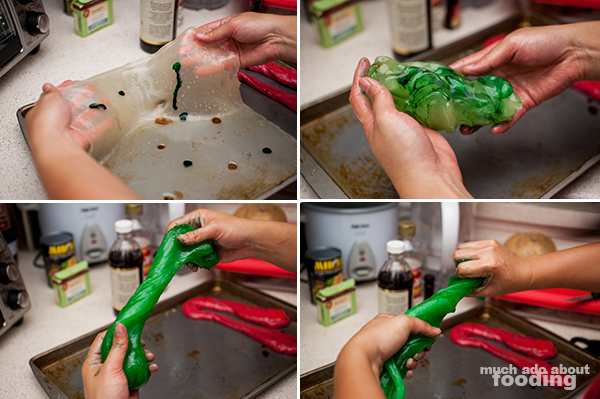 I hope you buttered your baking sheet well because that will make it easy for you to pull the taffy off of it. Forgive the look of the dirty baking sheet by the way - that's definitely NOT discoloration on the candy itself but just the stains on my sheet. 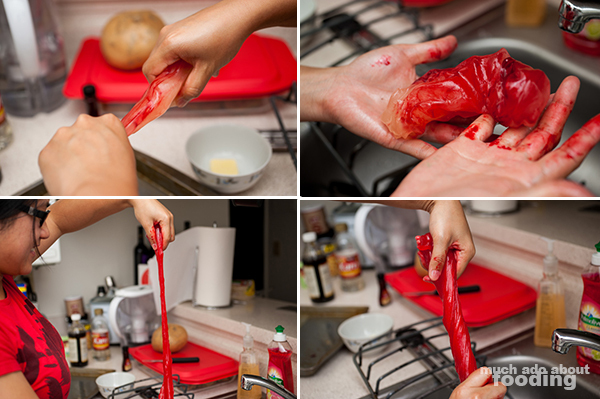 Anyhow, hopefully you won't burn your hands removing the red section of the taffy. 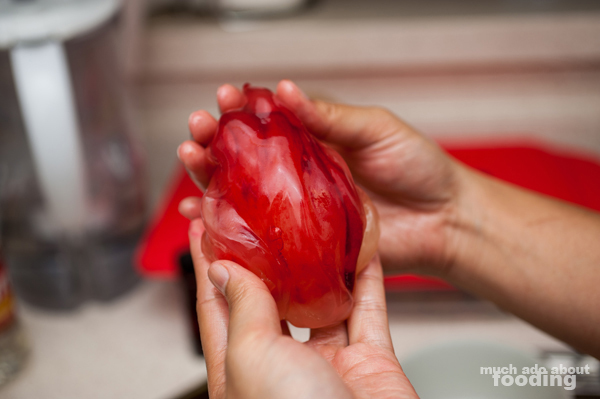 I found that when I had wrapped up the taffy into a mound I could work with, it looked like a beating heart with veins (see picture); nice. It will be a dark red first but after much pulling, it will get lighter and lighter with the aeration and distribution of color. Twist in your hands and pull outward from you. You can't over-pull but you can certainly under-pull so keep doing until the taffy is nice and pliant but still firm enough to handle. Then add in the black lava sea salt and pull a few more times to incorporate these "seeds." I didn't say to do it earlier in case the crystals started dissolving. Some of the places I looked up had said it would take 15-20 minutes to pull. It took me less time but I think that's just because I've got some biceps and forearms working out well for me. I especially liked working with the green part because it looked so jewel-like in the beginning. It was gorgeous, unlike the reminiscent beating heart of the red section. Remember as you pull to twist in before pulling apart and folding it onto itself for repeated motions. 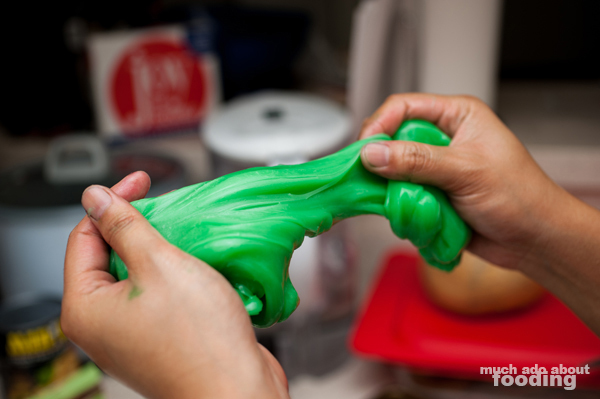 Constantly re-butter your hand to prevent the taffy from sticking. Again, the color will become lighter and more pastel-like as you work with the candy. We actually found that buttering some wax paper worked out well for a workstation that we could throw away without having to deal with washing butter off. 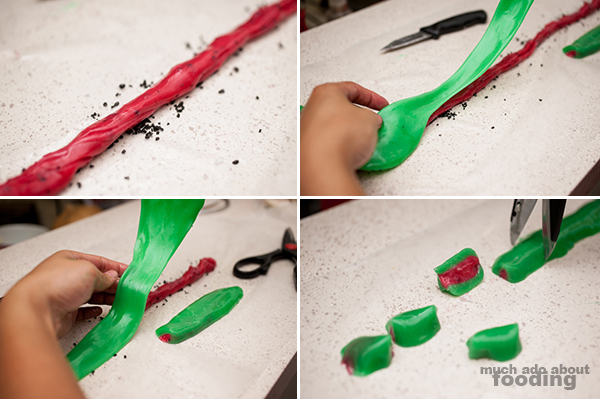 While I worked on shaping the taffy, Duc cut wax paper squares to wrap the pieces in later. 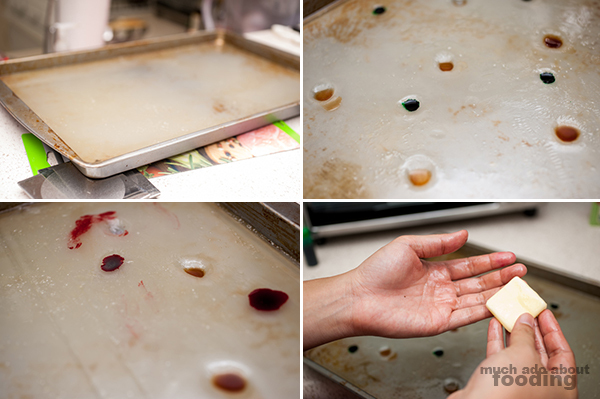 Before laying down the red piece, sprinkle some black lava sea salt onto the work area for more "seeds" to add. Because of my small workspace, I ended up dividing my amounts into thirds and doing the candy in three runs. Anyhow, roll out the red into a thin rope on top of the sea salt. Flatten some of the green section you were working with (remember Airheads? like those!) and lay careful on top of the red. Butter scissors and cut into the sizes you want. 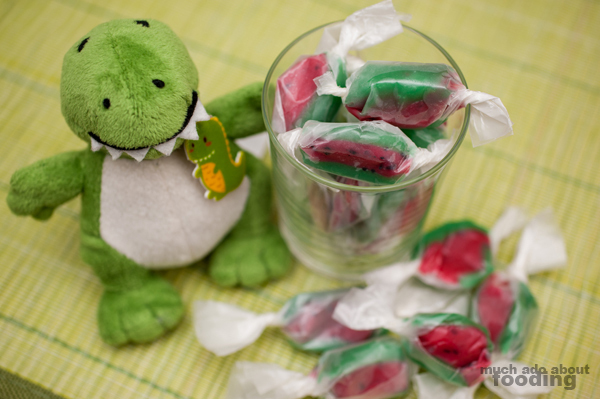 As each piece is cut, you should wrap it up nicely soon after to ensure that your room's temperature doesn't cause the candy to flop over and go melty on you. 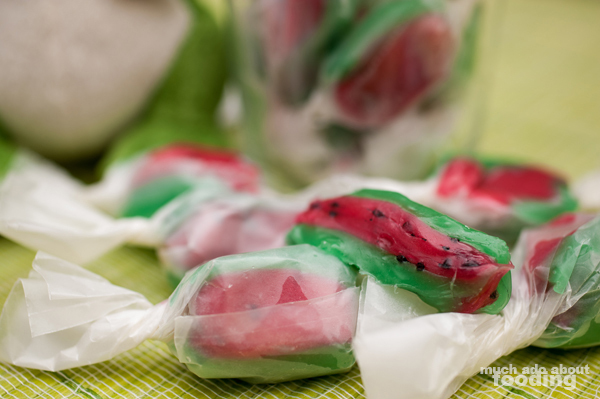 However you are deciding to wrap them, I suggest that the watermelon side is placed flat on a portion of the wax paper so that it is very visible. Enjoy sharing with your friends!